by mixing V-twin low rider style with timeless cafe racer attitude. With its muscular air-cooled V-twin engine, as well as a compact and agile handling chassis equipped with clip-on handlebars and rear set footrests, the bold new XV950 Racer adds another dimension to the Sport Heritage line up. 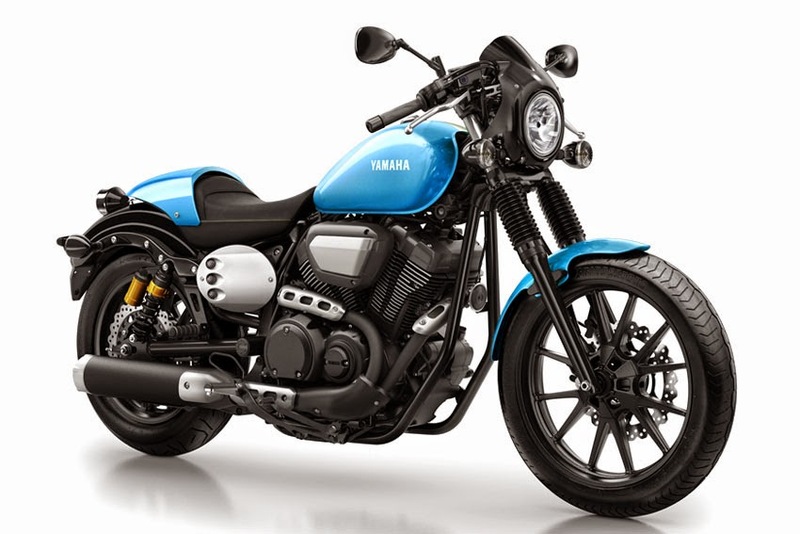 Featuring raw, minimalist and original styling that draws on low rider and cafe racer influences, this new model represents a new concept in sport V-twin design, and underlines Yamaha's on-going commitment to the development of original and exciting motorcycles in the Sport Heritage range. Producing maximum torque of 8.1 kg-m at 3,000 rpm - and maximum power of 52.1 PS at 5,500 rpm - the 942 cc air-cooled 60-degree V-twin engine is built to deliver strong acceleration from low engine speeds. The bike's short and low chassis ensures agile handling performance both in the city and on twisty back roads, and this combination of a gutsy engine and agile chassis - as well as the special mix of low rider style with cafe racer ergonomics - makes the new XV950 Racer a truly unique and exciting motorcycle. What distinguishes the new XV950 Racer from other models is its forward-leaning riding position that gives the rider a great sense of unity with the motorcycle for a sporty riding experience. This has been achieved by the use of forged aluminium 22.2 mm diameter clip-on handlebars that are positioned 156 mm further forward and 78 mm lower than on the XV950/R models. The fact that the bars are 22.2 mm diameter - as opposed to the larger diameter designs used on the other XV950/R models - enables the use of slimmer supersport type handlebar grips that reinforce the sporty character of this gutsy and agile V-twin. The clip-on handlebars are equipped with compact new switchgear and clutch/front brake levers that reinforce the sport-oriented feel, and the front brake's master cylinder has also been reduced in size. The fitment of a black coloured aluminium plate on the handlebar crown highlights the bike's racer-looks - and the classic-looking single instrument pod is centrally positioned above the headlamp. To complement the compact and sporty look of the frontal area around the new clip-on handlebars, the XV950 Racer features newly positioned flashers that are mounted on the lower triple clamp. As well as the use of exclusive new clip-on handlebars, the XV950 Racer also features newly developed rear-set footrests that are 150 mm further to the rear and 29 mm higher than those fitted to the XV950/R. The Racer's slim new single seat is 75 mm higher than the XV950/R models, and the new ergonomics help to centralize the rider/machine mass for sports handling performance together with improved cornering and high levels of riding comfort. The slim new single seat is fitted with a compact and lightweight cover that blends beautifully with the steel rear fender. Together with the clip-on handlebars and rear-set footrests, this gracefully curved cover enhances the bike's cafe racer styling. The XV950 Racer comes equipped with a mini cafe racer cowling that, together with the single round headlight and clip-on handlebars, perfectly captures the spirit of the original cafe racer movement. Another feature that marks this machine out as an original are the aluminium side number plates. Featuring three 'weight reduction' style holes, these plates - together with the cowl and seat cover - underline the bike's cafe racer soul and emphasise the metallic rawness that makes this air-cooled V-twin so desirable. The front and rear suspension systems on the XV950 Racer have been developed to match the sporty character of the machine, and the 41 mm forks offer 144 mm travel, 9mm more than on the XV950/R models. Classically styled fork boots are fitted to the new black-coloured forks, reinforcing the bike's timeless good looks that are designed to appeal to riders who appreciate attention to detail. The twin rear piggyback gas shocks have also been developed to suit the new Racer model, and give 116mm of rear wheel travel, 6mm greater than the XV950/R. These changes enable the rider to enjoy the bike's strong engine and chassis performance while also maintaining the high levels of comfort associated with all of Yamaha's Sport Heritage models. For a balanced and sporty look, the air-cooled V-twin engine is equipped with a new V-bank cover. Manufactured from resin and featuring circular holes that match those on the aluminium sideplates and exhaust system, this cover is mounted on the engine's left side in the same position as the right side mounted air cleaner.